COPPER (366.20) closed the week on negative note losing around 2.60%. As we have mentioned last week that support for the commodity lies in the zone of 375 to 376 where Fibonacci level is lying. If the commodity manages to close below these levels then the commodity can drift to the levels of 370 to 372 where long term Fibonacci level is lying. Below these levels the commodity can drift to the levels of 362 to 364 where the commodity has taken support in the month of November-2016 and December-2016. 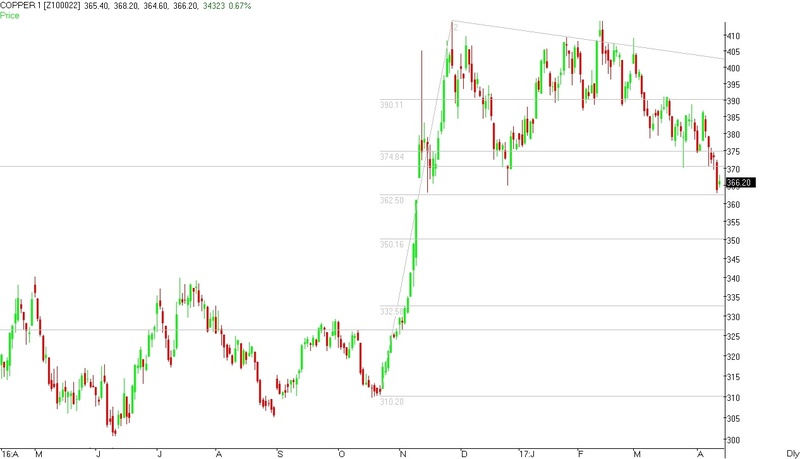 During the week the commodity manages to hit a low of 363 and close the week around the levels of 366. Support for the commodity lies in the zone of 362 to 364 where the commodity has taken support in the month of November-2016 and December-2016. If the commodity manages to close below these levels then the commodity can drift to the levels of 358 to 360 where 200 Daily moving average is lying. Resistance for the commodity lies in the zone of 370 to 371 where Fibonacci levels and lows for the month of February-2017 are lying. If the commodity manages to close above these levels then the commodity can move to the levels of around 375 to 377 from where the commodity broke down and Fibonacci level are lying.